Before becoming a heart recipient, Stephanie Zimmerman, RN, MSN was a nurse practitioner caring for pediatric cancer patients. Susceptibility to infections and rejection of the donated organ are two of the many side effects of undergoing a transplant. Stephanie shares her experiences on her blog: Living the Cure. Guest post by Stephanie Zimmerman, RN No one will EVER be as invested in your outcome as you are. That’s the message I’d like to convey today after an experience I had recently. It’s a reminder to myself and others of the importance of speaking up for ourselves. I was hospitalized before Thanksgiving for an unexplained high fever and sent home on IV antibiotics. On the day after coming home which also happened to be day nine of 14 of the IV antibiotics, the home health nurse arrived. She leaving announced that she was going to take the Peripherally Inserted Central Catheter (PICC) line out of my right arm. I was quick and firm in telling her that there was a mistake. My therapy was scheduled through Monday at which point I would see my doctor and his IV nurse would remove the PICC line. This nurse was as confident that she was right as I was that she was wrong. I asked to see the doctor’s order. 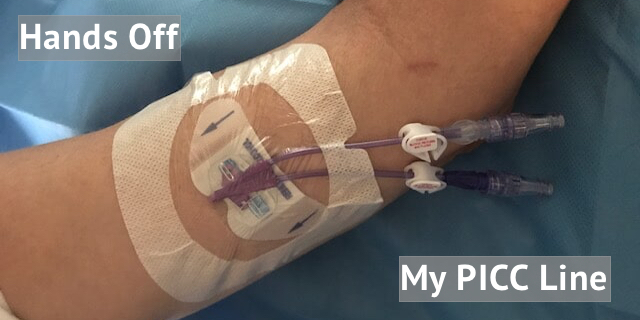 As a nurse, I would have expected a clear order from my doctor stating that the course of antibiotics was being shortened, thus the PICC line is no longer needed. It would say, “Please remove on 11/21/2018 visit to the patient’s home. Signed AND dated by the physician with that day’s date.” Instead, the nurse handed me an order dated 11/16/2018 that stated in the nursing notes ‘D/C on 11/16/2018’, the date I was discharged from the hospital. I explained this to her along with the fact that I had five doses of antibiotics yet to be given. She promptly told me that I could refuse the removal at my own risk. Then, of course, she would document that I was noncompliant with the plan of care, potentially leading my insurance company to deny paying for the remainder of my antibiotic therapy. Confident that I was correct and my physician would have my back, I refused to allow her to pull the line; I did permit her to changes the dressing. Funny thing: it turns out that I was correct. Had I permitted her to remove the line, I would have ended up back in the hospital having another line placed so I could complete my course of antibiotics and ensure the blood infection was effectively treated. I spoke up on my own behalf and I saved myself a lot of grief, my insurance company, a lot of money, and that nurse, disciplinary action, if not her job. It’s not an easy thing to confront a healthcare provider with information that varies so greatly from what they are telling you, but you MUST for your safety and wellbeing. Medical errors are the 3rd leading cause of death in hospitals in the United States. I didn’t relent; however, many others would have and the result could have been catastrophic. Remember if you don’t speak up on your own behalf, then who will? You are your own best and strongest advocate! Thank you for writing this. I, too, am a retired RN who has been through major medical treatment. Colorectal cancer at age 55. Prognosis, 50/50 chance of surviving for 2 years. This was 2006. Thank goodness I was at a major medical center that offered a study with a new, atypical chemo called avastin. I believe this saved my life. The treatment was still very difficult. The medical knowledge that I had helped me to survive. I cannot imagine going through difficult medical treatment with no medical knowledge. I guess that’s why medical mistakes take so many lives. I think that education is desperately needed. Doctors, nurses, all medical personnel are in short supply. So much is expected of them. Hospitals are focused on the bottom line. Until this is fixed, medical errors will continue to happen.